The intent of this project to get the Ice Cream Person recognized among the greatest of supernatural beings, (right up there with Bigfoot, Lochness, and UFOs). Right now I’m collecting artist renditions as evidence. I’m mailing postcards with a cone template printed on it, for fellow advocates to complete and return. 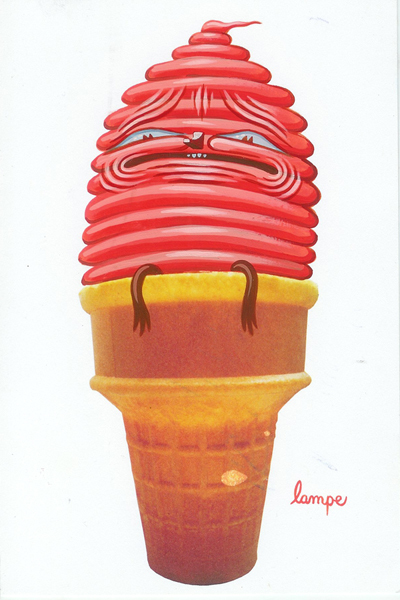 The postcards will be archived online at IceCreamPeople.org, and I’m planning the real-life exhibition now. If you’d like to get involved, e-mail icecreamfriend@gmail.com with your mailing address.